The RBI is taking all proactive steps to contain raging inflation and CRR hike of 25 basis points, and a repo rate increase of 50 basis points is a step in that direction. Both, industry and common man, are going to get affected by this move of the apex bank. The markets, which were expecting the RBI to hold the rates or at least raise it by 25 basis points, tanked as news came out of the higher increases in repo rate and CRR. Dyeing units, that rely on China for nearly 70 per cent of their raw material supplies, are going through a tough time with China stopping exports of dye stuffs in view of the forthcoming Olympics. Having completed one year in the domestic market, Mahindra-Renault is now eyeing the overseas market for expansion. The company is presently exploring the right hand drive markets in South Asia and Africa to export Logan. Rising ATF costs and stricter emission regulations envisaged for the future have now ensured that the airline industry works out a cheaper as well as greener alternative to fossil fuels. 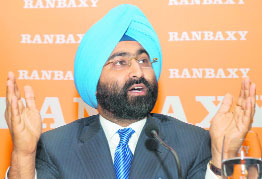 Pharma major Ranbaxy today reported a consolidated profit after tax of Rs 160.8 crore for its second quarter ended June 30, with consolidated sales at Rs 1,829.6 crore. Bankers today said interest rates for borrowers, including car and home loan customers, could go up by up to one per cent, following RBI's monetary measures announced to control inflation. Corporate giants Tata Power, Larsen and Toubro (L&T), GMR Infrastructure and DCM Shriram are among companies eyeing a stake in hydropower projects in Himachal Pradesh, a senior official said Tuesday. Tata Power, the country's largest private sector power utility, and L&T are trying to test waters in the hill state for the first time, and have evinced interest in projects in Lahaul and Spiti district. CEOs heading America's 500 largest firms have taken a beating on their paychecks for the first time in five years, but the 13 female members of this elite club, headed by India-born chief of PepsiCo Indra Nooyi, have a reason to smile with a trend-defying hike. According to data compiled by US business magazine Forbes, CEOs of the 500 largest companies in US saw their compensation dwindle by an average 15 per cent in 2007, but the 13 female CEOs saw their pay jump by an average 27 per cent. The RBI is taking all proactive steps to contain raging inflation and CRR hike of 25 basis points, and a repo rate increase of 50 basis points is a step in that direction. Both, industry and common man, are going to get affected by this move of the apex bank. On industrial front, the growth of the economy, project delays, stalling of planned project, and unemployment are some of the concerns raised by the industry. For the common man, who is already pressed for inflation, there is a bad news. Personal, housing and auto loans are all going to see a hike. However, the deposit rates will go up and that could bring a smile for savers. Bankers reacting to the RBI move conceded that both lending and deposit rates were likely to go up by a minimum of 0.5 per cent. “We have to assess what is the actual impact and a decision would be taken accordingly. A minimum 0.5 per cent hike in our BPLR and deposit rates cannot be ruled out,” said Punjab National Bank's CMD K.C. Chakarabarty. On the industry front, Sajjan Jindal, president, Assocham, reacting on the hike, said: “Tightening of the money supply may lead to a fall in the overall business confidence, with companies postponing their investment plans in the time to come. With decline in the forex reserves recently, which has reduced the overall money supply in the system, a further hike in the interest rates could decelerate the situation further”. President of Federation of Indian Export Organisations (FIEO), Ganesh Kumar Gupta, stated that increasing the fixed repo rates and CRR would impact export credit rates to small and medium enterprises. Dr L.K. Malhotra, president, PHDCCI, has expressed apprehensions regarding future growth rate in the industry, overall corporate sector’s financial situation, capacity utilisation, profit margins and employment. “Growth in industrial output has slowed down and may further decline due to a slowdown in the GDP growth. Moderation in economic activity may impact expansion of new jobs and even lead to layoffs in certain sectors”, he said. Meanwhile, CII has stated that these were expected policy responses to inflation, though it might have been possible to await the lagged effects of the last round of monetary actions in June before taking these steps. Concerns about sustaining growth in the environment of monetary tightening remain. Recent industrial growth numbers point to a moderation in the growth momentum. However, CII surveys have shown that industry's sentiment towards investment is still strong. Many sectors are operating at close to full capacity, and are therefore planning capacity expansions. Such capacity expansions would fuel investment demand and keep the growth momentum strong. Increase in interest rates could impact the investment momentum and corporate cash flows. The future trends in corporate profitability and execution of the investment pipeline would need to be monitored in this context. Sensitive industries like banking, realty and auto, and infrastructure sectors like capital goods and power took a hammering. Worsening the situation was the selloff in global markets on the back of worries over US financial companies. The Sensex closed at 13,791.54, down 557.57 points or 3.89 per cent while in the broader markets the Nifty was down 142.25 points to close at 4,189.85. Among the major losers today include HDFC Bank which fell 8.71 per cent, ICICI Bank down 8.45 per cent, Reliance Infrastructure down 7.99 per cent. Gainers included Nalco, which was up 3.56 per cent and HUL which was up 3.01 per cent. Among sectoral indices the BSE Bankex was down 562.22 points or 8.31 per cent to close at 6,199.60. Bank of India, Axis Bank, Kotak Mahindra, IOB, Bank of Baroda, ICICI Bank and HDFC Bank were the big losers. Rising interest rates also spooked investors in the realty sector which was down 281.41 points or 5.54 per cent at 4,797.71. Meanwhile, the immediate reaction from different banks is that interest rates, including housing and car loans, would increase by one per cent in response to RBI's tight monetary policy. Media statements issued by public and private sector bank chiefs indicate that banks' earnings could come under pressure and the lending institutions would pass on higher costs to customers. "We would see a regime of high interest rates for sometime. If the cost goes up, lending rates would go up but we have to watch how the market reacts," ICICI Bank joint managing director Chanda Kochhar said. Industrialists said it was only a select few units and traders, who procured material in bulk quantities in advance, and are benefitting from the scenario. As a result of the shortage, most units are forced to rely on domestic supplies, the prices of which have increased by over 30 per cent in the past few weeks. "Nearly 250 small, tiny and medium enterprises are suffering due to scarcity of raw material as we relied for most of our supplies on China that has banned exports of dye stuff for the time being. There are other hurdles like a poor power supply and rise in petroleum and diesel rates that have worsened our situation," Brahm Dutt Sharda, president of Dyeing Factories Association, told The Tribune. Owners of dyeing units said domestic rates had increased manifold due to the shortage. As a result, dyeing units effected a hike in charges. While prices for dyeing of yarn have increased by Rs 3-5 per kilogram, those of cotton have increased by Rs 10. Rates for polyster yarn, too, have recorded high rise, said manufacturers. The rise would have a bearing on industries like hosiery and knitwear manufacturers. In spite of the rise, industrialists rued they were unable to maintain their margins on account of factors like power scarcity and labour shortage. "Costs have increased not only due to shortage of dye stuff but also due to higher spending on gensets and workers. Now we are only waiting for China to restart exports so that the situation normalises." This was revealed by the chief operating officer (COO), Mahindra-Renault, Nalin Mehta, while talking to TNS, here today. In town to launch a limited edition of Logan, Logan Edge, he said, "We are exploring the right-hand drive markets like South Asia, and Africa amongst others to export the Logan. We plan to start exports this year," he said. Though he declined to quantify the exports that the company is looking at, he said they were in the process of studying the markets and assessing whether the car be exported as a completely-built unit (CBU) or a completely knocked-down (CKD) unit and then assembled in the countries where it is exported. Mehta said the company was also planning to launch LPG variant of Logan in the next two months. "There is a growing demand for gas-based variants and we would make it available in the coming months and in certain cities it would be available earlier," he said, adding that CNG variant was available at limited places and in three months will be available in all cities. The COO said in their first year of operations, the company had sold out 25,890 units, and managed to get a 12 per cent share in the C segment cars. "In spite of rising inflation and tightening of money in the market, we are hopeful that the car market would continue to have a double-digit growth. We are looking to be a serious player and have plans to be present in more segments." Mehta said though last year the company had taken its production to full capacity in the first year of operations, their plant at Nasik had the capacity to ramp up production further depending on market conditions. He also added that the company was expanding its dealership network to 140 in the current fiscal, up from 94, thereby expanding its presence from 94 cities to 136. World's leading airlines and manufacturers of commercial airliners are testing ATF derived from bio-fuel sources. Boeing’s senior vice-president (sales) Dinesh Keskar says bio-fuels have had a good start and Virgin Atlanta recently tested biomass-derived fuel on an engine during a demonstration flight. Biomass-derived jet fuels have the potential to become alternative to fossil fuels within the next couple of years. Japan Airlines Corporation, too, is planning to fly a commercial flight powered by second-generation bio-fuel as part of campaign to cut carbon dioxide emissions. The experimental flight is expected to take place in March 2009. World over airlines are reeling under rising ATF prices and resorting to rigorous cost-cutting efforts to cope up. International Air Transportation Association (IATA) has forecast the industry loss at $2.3 billion with the average oil price of $106.5 per barrel and $6.1 billion with an average oil price of $135 per barrel. It says the airline industry's total fuel bill for 2008 is expected to be $176 billion with oil at $106.5 per barrel. In contrast, the total fuel bill for 2002 was $40 billion. Keskar says for every dollar that the price of fuel goes up, the airline industry costs increases by $ 1.6 billion. In India, domestic jet fuel cost doubled in the past one year. The ATF prices have gone up from Rs 21,000 per kilo litre in 2004 to more than Rs 70,000. Losses for the aviation industry in 2008-09 have been estimated at Rs 8,000 crore, double of what it suffered during 2007-08. But it is not just the rising ATF costs. The airline sector has emerged as favourite bad boy of the Green brigade and the industry is facing mounting pressure to curb emissions and look for more eco-friendly fuels. Commercial airliners are said to account for two per cent global carbon emissions. However, the figure is expected to rise along with rising volume of air travel. Airlines are also looking for other ways to reduce fuel consumption, including operational and maintenance procedures and practices. Some airlines are towing airplanes to runways, rather than having them taxi under their own power to cut pre-flight fuel consumption, reducing passenger service and entertainment items, monitoring weather and air traffic at airports to adjust speed of planes to prevent circling overhead. Ranbaxy also said it was confident that the motion moved by the US Department of Justice against the company on standards of certain drugs would be withdrawn. The second quarter PAT was only marginally higher than the Rs 160.4 crore profit after tax posted in the year-ago quarter. The consolidated total sales of Rs 1,829.6 crore represented an increase of 12.67 per cent over the corresponding quarter last year, the company said. "We have a communication with the US regulator and based on that we are confident of the motion being withdrawn," Ranbaxy CEO and Managing Director Malvinder Mohan Singh told reporters here. Steel maker Bhushan Steel Ltd has announced a standalone net profit of 132.68 crore for the first quarter ended June 30, 2008, indicating a 35.19 per cent growth over the corresponding period a year ago. The standalone total income of the company increased to Rs 1,321.35 crore in the latest quarter from Rs 967.25 crore in the year-ago period. The board of directors recommended a dividend of Rs 2.50 (25 per cent) per share worth Rs 10 each, it said. Country's largest two-wheeler maker Hero Honda today reported a 43.74 per cent rise in its profit after tax for the quarter ended June 30 at Rs 272.87 crore as against Rs 189.84 crore in the year-ago period. The total income has also increased by 16.22 per cent to Rs 2,890.25 crore compared to Rs 2,486.90 crore for the corresponding period last year, the company said in a statement. State gas utility GAIL India today reported a 31 per cent growth in first quarter net profit on higher petrochemical margins and increase in volumes of gas traded and transported. Net profit in April-June stood at Rs 897 crore improved over Rs 685 crore from the corresponding period of last fiscal, a company statement said here. Turnover rose 35 per cent to Rs 5,731 crore in the first quarter of 2008-09, against Rs 4,246 crore a year ago. State-run National Thermal Power Corp today announced a net profit of Rs 1,726.53 crore for the first quarter ended June 30, 2008, a 27.15 per cent growth over the corresponding period a year-ago. The total income rose 6 per cent to Rs 10,256.70 crore in Q1 of FY'09, from Rs 9,687.84 crore in the corresponding period last fiscal. State-run Hindustan Petroleum Corporation's (HPCL) net loss for the first quarter ended June 30, 2008, has widened to Rs 888.12 crore from Rs 86.93 crore in the same period a year ago. Banks would pass on the additional cost to customers and there is pressure on the lending rates, said Bank of India chairman T.S. Narayanswami. According to UCO Bank chairman S.K. Goel, "The short-term lending rates would go up in between 50-100 basis points." Since RBI expects inflation to come down to 7 per cent by March which would lead to softening of the monetary stance. Long-term interest rate would remain unchanged, he said. Hinting at the hike in interest rate, ICICI Bank joint managing director Chanda Kochhar said, "We would see a regime of high interest rates for sometime. If the cost goes up, lending rates would go up but we have to watch how the market reacts." DCM Shriram and GMR have already been allotted power projects in Lahaul and Spiti and Chamba districts, respectively. Moser Baer, Bhilwara Energy Ltd and a subsidiary of the Jindal Group are also among the 102 bidders for 17 projects with a combined generation capacity of 1,968 MW. However, no foreign company has made a bid. An electricity board official said recent moves by the government against Brakel Corp NV of the Netherlands have discouraged global bidders. The projects, to be located in Lahaul and Spiti, Shimla, Kangra and Chamba districts, will be allotted to private companies on a build, own, operate and transfer (BOOT) basis, a senior engineer associated with the allocation of power projects told IANS on condition of anonymity. Most of the projects are located on the river basin of Sutlej and Chenab in the Lahaul and Spiti district. He said the electricity board was vetting the bids, and that the projects would be allocated by the year-end. Under the state's amended power policy, the bidder who offers more free supply to the state will be allotted a project, instead of the usual seeking of bids on an upfront premium basis. CEOs heading America's 500 largest firms have taken a beating on their paychecks for the first time in five years, but the 13 female members of this elite club, headed by India-born chief of PepsiCo Indra Nooyi, have a reason to smile with a trend-defying hike. According to data compiled by US business magazine Forbes, CEOs of the 500 largest companies in US saw their compensation dwindle by an average 15 per cent in 2007, but the 13 female CEOs saw their pay jump by an average 27 per cent. But despite the hike, the average salary of female CEOs is still just about half of the overall average. "The average take, including salary and bonuses, for all 500 CEOs was $12.8 million double the female average of $6.5 million," Forbes said. The fall in the total CEO compensation for these firms is the first since 2002 and comes after a "juicy 38 per cent collective pay increase in 2006," Forbes said. Forbes has named PepsiCo chief Nooyi as the top-paid female CEO in the US with a $12.7 million pay packet. Nooyi, who has been named as the fifth most powerful women in the world, is ranked 139th in terms of CEO pay for the 500 top companies in the US, as per Forbes.